Ansaldo’s 2016 claim — which came to light Thursday — is the latest spat between the city and the firm building the rail cars and communications system. The firm that’s delivering the driverless train cars and communications system for Honolulu rail has a “mega-substantial” claim against the city for the years of delay plaguing the project, city leaders disclosed Thursday. The city, meanwhile, is pressing its own claims against that firm, Ansaldo Honolulu JV, based on the contractor’s “performance issues,” according to Honolulu Authority for Rapid Transportation officials. News of this most recent dispute with Ansaldo surfaced at the Thursday HART board meeting as members continued to weigh a big shift in strategy to complete rail’s most difficult leg into town. 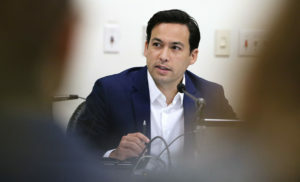 The new approach would involve a so-called “public-private partnership,” where the remaining $1.5 billion or so in construction costs would be backed by private financing. 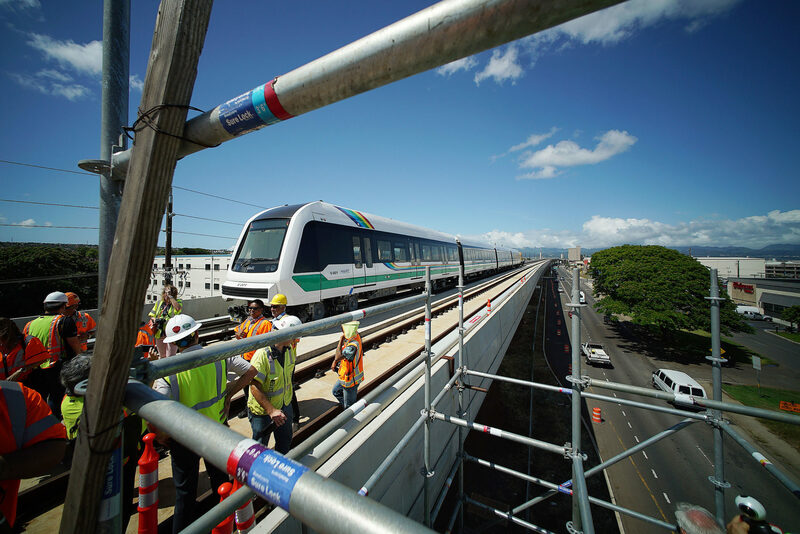 Workers test an Ansaldo-manufactured driverless rail car on the guideway above the Farrington HIghway. Ansaldo already has a $1.4 billion contract to design, build, operate and maintain the project’s trains and signaling systems. During meetings last week in Pittsburgh, top managers at the Hitachi-owned firm told rail leaders that they’ll need to resolve the lingering claim before agreeing to a participate in the new public-private partnership, according to HART board member Wes Frysztacki. Enrico Fontana, Ansaldo Honolulu’s managing director, could not be reached for comment Thursday. Frysztacki and other rail leaders, including HART Executive Director Andrew Robbins, would not delve into specifics of the claim because it’s still being negotiated. 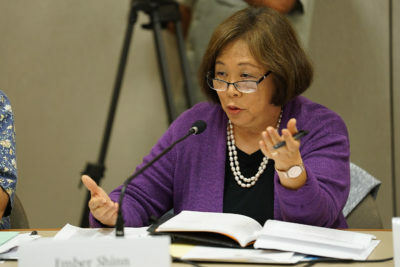 HART Board Member Ember Shinn asks a question during a recent rail meeting at Kapolei Hale. Robbins also declined to elaborate on how much money the claim involves. Nonetheless, Ember Shinn, a former managing director for the city and Frysztacki’s colleague on the HART board, indicated the amount was significant. “You all know the number, right?” she said to her board colleagues Thursday. “It’s substantial. I mean, it’s mega-substantial.” She expressed concerns over where the money would come from to settle the Ansaldo claim. Robbins said that HART has factored Ansaldo’s claim into its $8.16 billion budget. 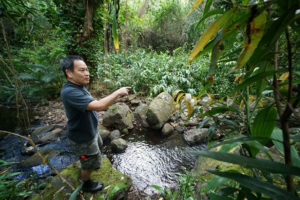 The firm first approached HART with its delay claim in October 2016, HART board members said, when the project was reeling from its most recent series of massive cost hikes. Thursday marked the first time that rail officials discussed the Ansaldo claim publicly. 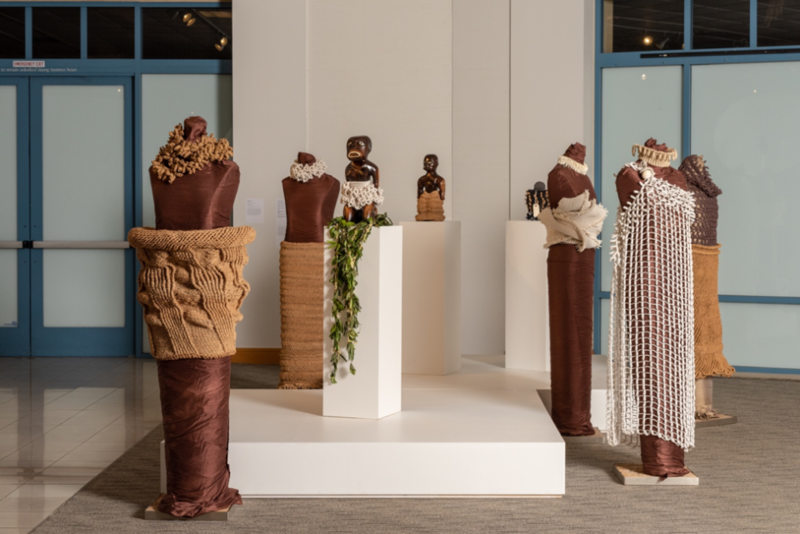 Ansaldo and the city have sparred over other aspects of the project ever since the firm beat out two other competitors vying for the massive scope of work. In 2013, rail leaders claimed publicly that switching from two-car to four-car trains would save about $20 million — but they failed to disclose that Ansaldo had claimed it would actually cost an additional $4 million. The firm has persistently dealt with staffing problems, to the chagrin of those overseeing the project. More recently, the firm scrambled to fix defects found in the aluminum beams used to form the frames of the trains coming off the assembly line. 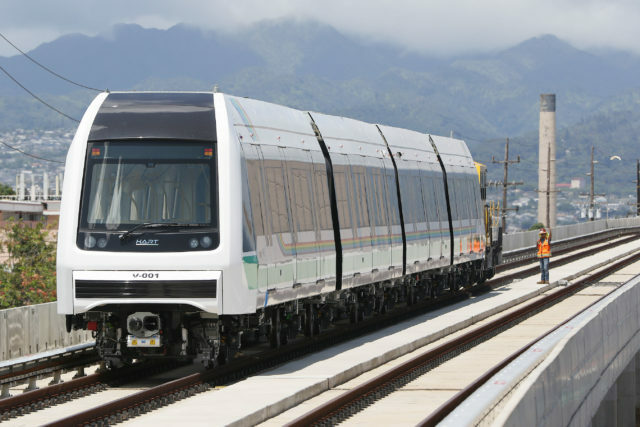 In recent months, crews have started running Ansaldo’s driverless train cars along the rail line’s elevated concrete pathway in West Oahu for testing. A HART train on display near the Farrington Highway in 2017. When Ansaldo first signed its rail contract, the entire 20-mile, 21-station line was slated to open in 2019. Now, officials say it won’t open until December 2025 at the earliest. Federal consultants estimate it won’t open until September 2026. For Ansaldo to complete much of its work, it must wait for the guideway to gradually be built eastward into town. As the concrete pathway takes shape, the firm follows behind, installing its electrical cabling and signaling equipment for the trains. 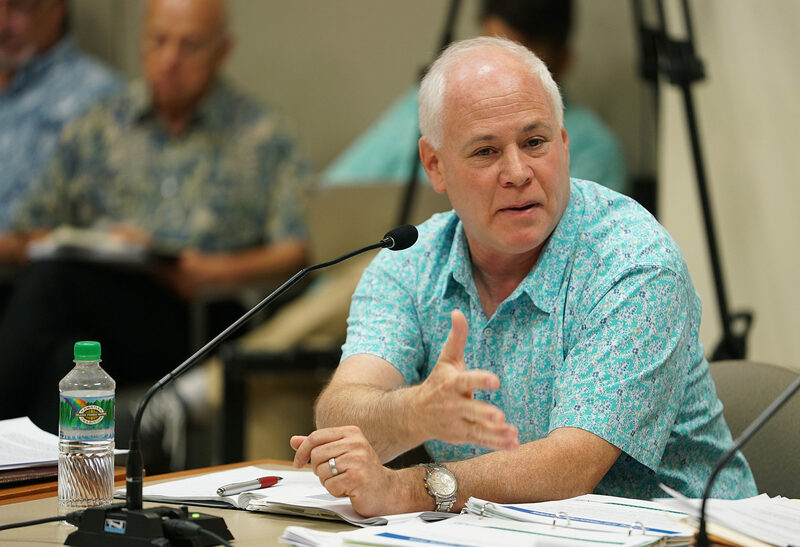 However, Robbins and other officials said Thursday that Ansaldo could work on other aspects of its contract — namely its operation at the rail operations yard in Pearl City — while it waits for the city to catch up on guideway construction. The project’s contractors are further obligated to try and work around such schedule obstacles, Robbins added. But it’s not clear to what extent that obligation applies. “I think it’s really an issue of delay and who’s responsible,” Robbins told the board Thursday. 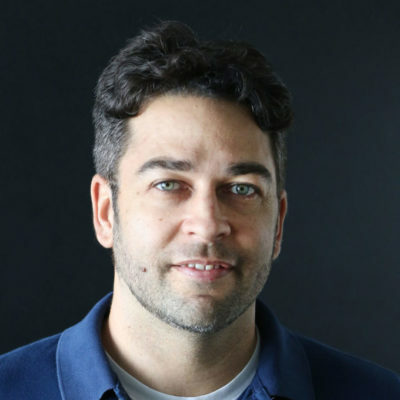 HART Executive Director Andrew Robbins said he was optimistic the dispute will be resolved by the end of the year. Frysztacki talked more about how some of the recent discussions with Ansaldo managers in Pittsburgh played out. They dealt with what the city saw as Ansaldo’s “quality of work, management of subcontractors” and “deficiencies” in other areas. Bob Good, HART’s senior project officer for core systems, “would spend five to 10 minutes describing in his mind where we were and what the problems were, and then different Ansaldo representatives would spend 10 to 20 minutes trying to respond to all that,” Frysztacki said. The contract to build the final 4.1 miles of guideway, from Middle Street to Ala Moana Center, isn’t expected to be awarded until next year. Robbins told the board he’s optimistic the dispute will be resolved by the end of 2018. 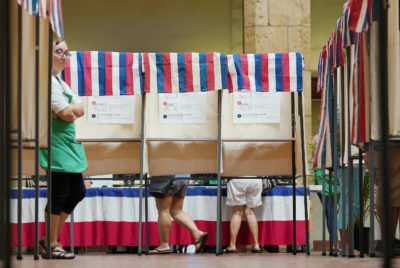 Honolulu Mayor, Kirk Caldwell called the resolution with Ansaldo critical. “There’s a lot of work to do in four months. Right, Andy?” the mayor said to Robbins.